Planning departments, especially those of smaller cities, have long hesitated because of technology, budgetary and other constraints to engage their constituents through web-based mapping tools. Part of the reason is simply an uneasiness with Web 2.0-esque mapping technologies. Well, these days they have less to worry about. That is, if they don’t mind piggy-backing on corporate giants. 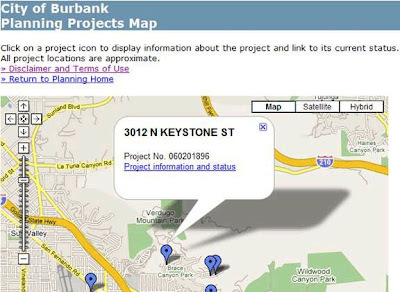 Recently, the BurbankLeader reported on how the City of Burbank, Los Angeles County, California, the not-so-undisputed “Media Capital of the World” with a comfortable population of 104,317 (2006), has trusted some online service providers and their armies of 24/7 network-support staff to host part of its mapping data. Not a mash-up feat by today’s standards, but the City has invited public input by publishing its planning project status using Google Maps‘s free Application Programming Interface (API). A note of caution for the impatient GIS Planner: While nowadays, a mash-up is more than a hack, most public map APIs are still constrained by their ask-coordinates-get-flat-tile design, albeit smart, when it comes to geometry-aware mapping that requires ‘queriable geometry’. 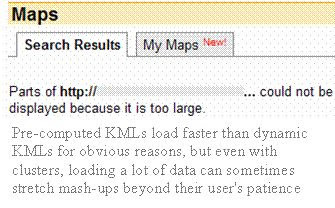 Consequently, despite the established familiarity of mash-ups, the appropriateness of such mash-ups to enterprise GIS for large-scale custom mapping is still debated. Then there is that question of commercial advertisements on publicly-funded maps. 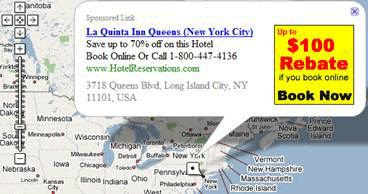 Note that there are ways around it: Google Maps for Enterprise, for one, allows the option to disable location-based advertising for an annual fee. The free Google Maps also requires map and custom data to be publicly-accessible. But as far as the cause of community’s access to information is concerned, it is well-served by such mash-ups. So nearly two years after chicagocrime.org– the seminal Google mash-up that won the 2005 Batten Award for Innovations in Journalism and was named by the New York Times as one of 2005’s best ideas (“It turns out that the best way to organize much of the information online is geographically.” – Do-It-Yourself Cartography, NYT), arrived at the mapping scene followed by hordes of Google Earth KMLs; At a time when some Elite Systems Research Institutes have already tried similar approaches and not quite succeeded; At a time when companies have been successfully built from mash-ups; At a time when real-estate mash-ups have become stale and foreclosure mash-ups have become hot; ‘smallish’ planning departments are warming up to the idea of neogeographic mash-ups as planning tools. Finally. � Follow Up : ESRI Ketchup! Subscribe to comments with RSS or TrackBack to 'Mash-ups as Planning Tools'. Hi there , I agree with this article, just sometimes I read so fast everything and I miss things that after read them again, I can understand it better.. 😉 . Your Mash-ups as Planning Tools Blog Stumbled up and Bookmarked, so I can keep updated on every article you write from now now on real estate industrial and commercial. Huh that was weird, my comment didn’t show up. Anywho I just wanted to tell you that it’s nice to know that somebody else also touched on this as it was troublesome finding the same information elsewhere. Yours was the first place that told me the answer. Much obliged.